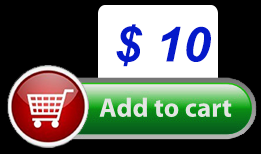 Decals are included with the kits, but are also sold individually for every kit as well. So, if you have any of the older kits in your 'stash that didn't originally come with decals, or you've somehow misplaced or damaged the ones that came with your kit, you can purchase them below. 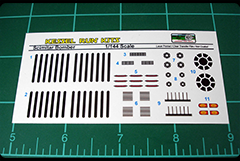 Notes: These decals will fit the 1/2500 MVM Tribal-class Frigate, but will also fit the older version of the kit sold by Delta Quadrant. 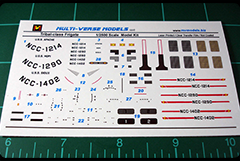 Notes: These decals will fit the 1/2500 MVM D-18, but will also fit the older version of the kit sold by Delta Quadrant. 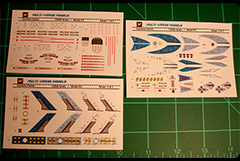 Notes: These decals will fit the 1/144 Scimitar Bomber originally released by Al Wong, or the one from Kessel Run Kits. Notes: Designed to fit the Military Transport kit by Design Anomaly, which was once made by another kit maker. If you already have this older kit in your stash, this set now comes with two resin nacelles to more accurately recreate one of the two versions of the ship. 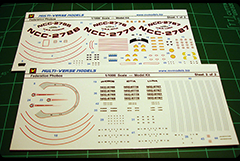 The decals come with full sets of two different races, or generic options if you prefer, so you could upgrade two old kits in your stash with this one set. 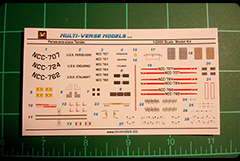 Notes: Designed to fit the newly remastered HIdeki, but will also fit the original NovaHobbies Hideki. 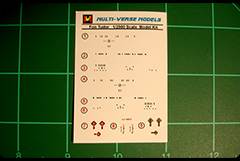 Notes: These decals are the perfect addition to your Timeslip 1/1000 Phobos. 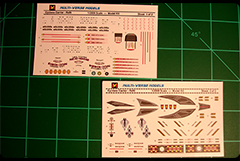 Before re-releasing this kit here at MVM, the decal sheet was expanded to include additional details, complete windows, and 3 names and registries - PHOBOS, LUNA, and IOTIA. Notes: Designed to fit the remastered MVM Federation Charger. 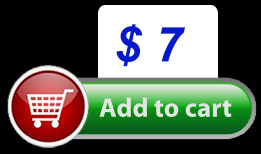 All decals will fit the original Ravenstar kit with the exception of the deflector dish, which was changed during remastering. You may use this deflector decal if you sand away the Ravenstar deflector details. 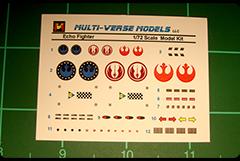 Notes: These decals will fit the MVM Echo Fighter and the original kit released by Model Addix. 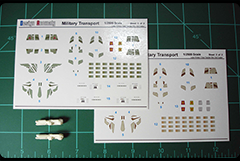 Notes: These decals will fit the MVM Persevere, but will also fit the older version of the kit sold by Ravenstar Studios. Notes: Includes three names and registries - USS Cyclone, USS Hurricane, and USS Tempest. 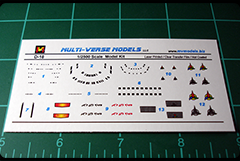 Decal set will fit the MVM Cyclone Carrier, but will also fit the older version of the Cyclone kit sold through MMI. Notes: Includes three names and registries - USS Cyclone, USS Hurricane, and USS Tempest. 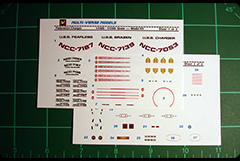 These decals will fit the MVM Cyclone Refit, but will also fit the older version of the Cyclone kit sold through MMI if the additional Cyclone Refit nacelle and pylon set are purchased from the "Parts Page". 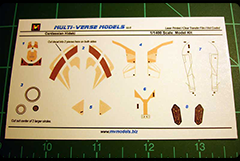 Notes: Designed to fit both the MVM Klingon D-32 and the original Ravenstar kit, these decals include windows for making your model either 1/1400 or 1/2500 scale. 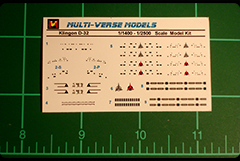 Notes: These decals will fit the MVM Fon Tu'Dor, but will also fit the older version of the kit sold through MMI under the name Fon Tutor.